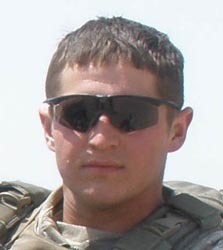 Corporal Ryan C. McGhee, 21, was killed in action on May 13, 2009 by small arms fire during combat in central Iraq. He served with 3rd Battalion, 75th Ranger Regiment of Fort Benning, Ga. This was his fourth deployment, his first to Iraq. Ryan was engaged to Ashleigh Mitchell of Fredericksburg, VA. He is survived by his father Steven McGhee of Myrtle Beach S.C., his mother Sherrie Battle McGhee, and his brother Zachary.